"Although many people assume that all homeopathic medicines are highly diluted and therefore unlikely to cause harm, many of them contain high concentrations of active ingredients and therefore can cause side effects and drug interactions." By far the hardest thing to swallow from a medical fundamentalist is the idea that a homeopathic remedy is too concentrated. 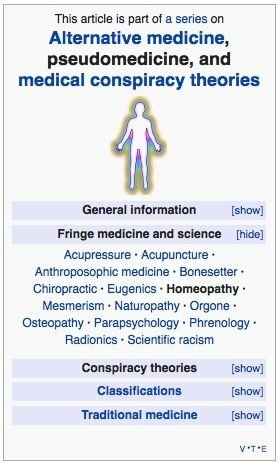 These are the same folks dedicating 30,000 words on Wikipedia to the idea that homeopathy doesn't have enough medicinal substance in it to work! Indeed, there are homeopathic medicines that we use in tincture. These include plant remedies like Hypericum (St. John's Wort), Valeriana (Valerian root) and Urtica urens (Stinging Nettle), substances that can be used directly as herbs without being prepared homeopathically. Some of these can be used internally as an herbalist would use them, but the most common homeopathic use for tinctures is for external application. So, while there are some low potency homeopathic preparations out there that might, if taken repeatedly and unsupervised for a period of time, cause a toxic reaction, they account for a very small proportion of homeopathic prescribing. No one under the supervision of a homeopathic practitioner is likely to come anywhere near a toxic reaction to a remedy, no matter how frequently repeated. Most importantly, none of these preparations are as “highly concentrated” as a tablet of ibuprofen.